Today is the Eve of Ólavsøka in the Faroes, a self governing island nation within the Kingdom of Denmark, located north of Scotland between Iceland and Norway. 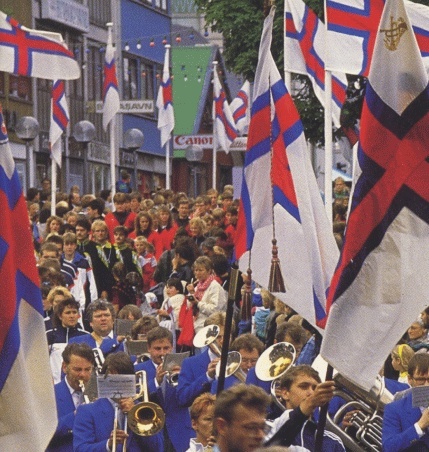 Ólavsøka (St Olaf’s Wake) is celebrated on July 29, but the festivities actually begin (as with so many European saints’ festivals) on the eve, that is, July 28, with a parade with speeches, and rowing races in the capital, Tórshavn. Before the Reformation, the Wake of St. Olaf was an important religious festival in Norway and the Norwegian tributary countries, of which the Faroes were one. The Norwegian king Olaf II fell in the battle at Stiklestad in 1030. He was almost immediately canonized and his cult helped unify Norway. Every year on the anniversary of Olaf’s death Norway commemorated him as its patron saint. The celebrations have faded in Norway, but continue full force in the Faroes. Despite speculation that Irish monks may have migrated north to the Faroe Islands long before the Vikings arrived, no certain evidence has been found that people lived on the Faroe Islands before around 800. In a Latin account of a voyage made by Saint Brendan, an Irish monastic saint who lived around 484–578, there is a description of ‘insulae’ (islands) resembling the Faroe Islands. This, however, is far from conclusive. It is known that Norsemen settled the islands c. 800, bringing the Old Norse language that evolved into the modern Faroese language. 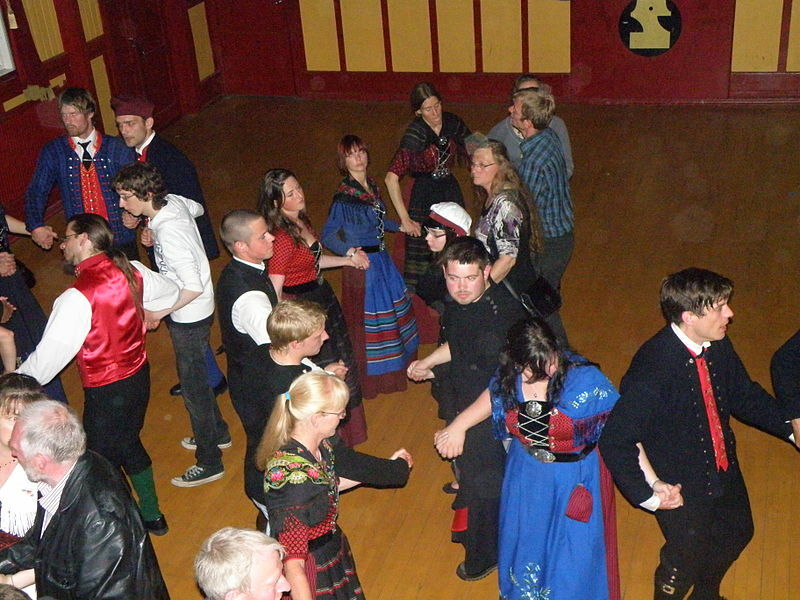 These settlers are not thought to have come directly from Scandinavia, but rather from Norse communities surrounding the Irish Sea, Northern Isles, and Western Isles of Scotland, including the Shetland and Orkney islands, as well as Norse-Gaels from western Scotland and the Isle of Man. 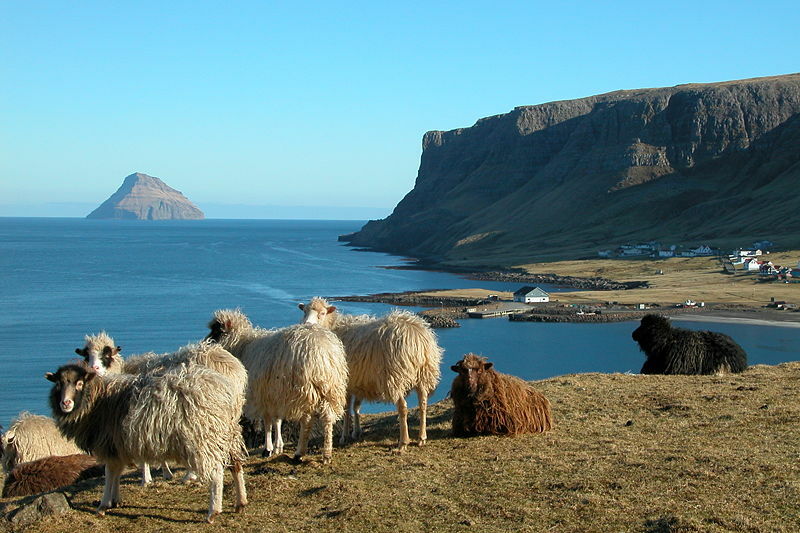 The culture of the Faroe Islands has its roots in coastal and insular Nordic culture. 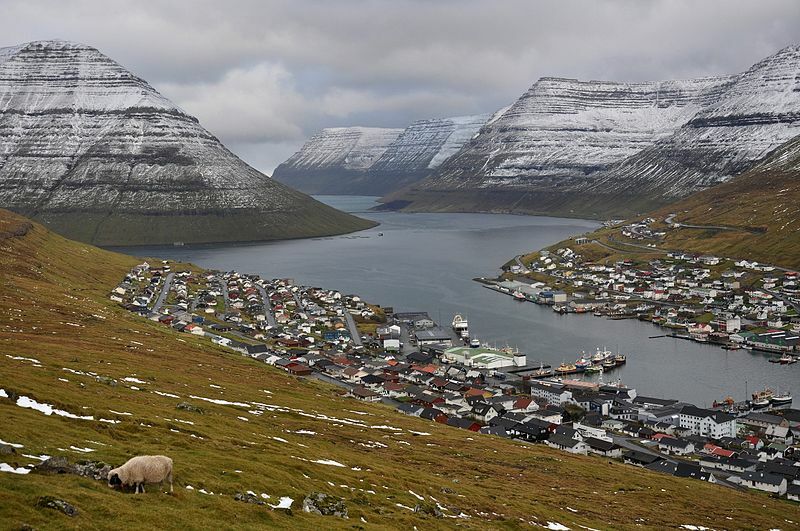 The Faroe Islands were long isolated from the main cultural phases and movements that swept across parts of Europe. This means that they have maintained a great part of their traditional culture. The language spoken is Faroese and it is one of three insular Scandinavian languages descended from the Old Norse language spoken in Scandinavia in the Viking Age, the others being Icelandic and the extinct Norn, spoken in the Shetland and Orkney Islands until the end of the 18th century, and which is thought to have been mutually intelligible with Faroese. Until the 15th century, Faroese had a similar writing system to Icelandic and Norwegian, but after the Reformation in 1538, the ruling Danes outlawed its use in schools, churches and official documents. Although a rich spoken tradition survived, for 300 years the language was not written down. This means that all poems and stories were handed down orally. These works were split into three categories: sagnir (historical), ævintýr (stories) and kvæði (ballads), often set to music or the mediaeval chain dance. These works were eventually written down in the 19th century. 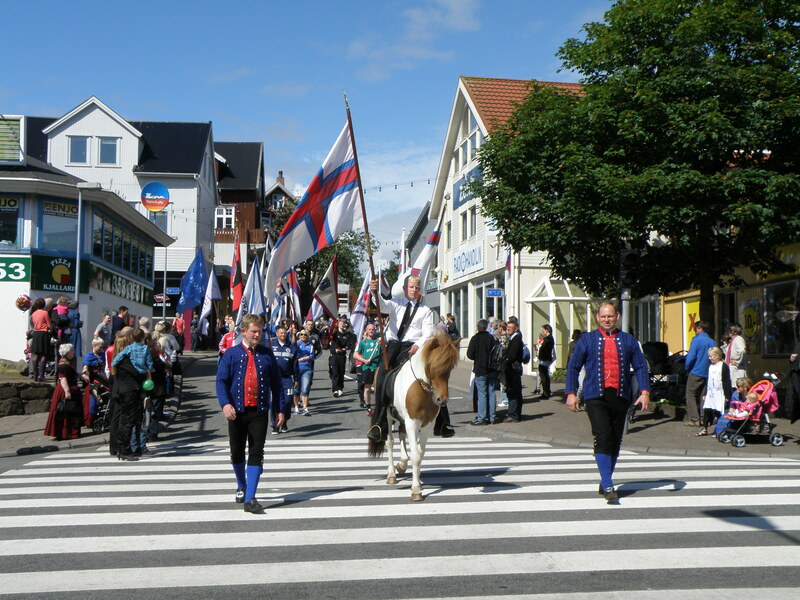 Normally the opening of Ólavsøka on July 28 starts with a procession of sports people from Tórshavn, city council members, a brass band and people riding on horses. They walk in procession from the public school, Kommunuskúlin, down to the center of town to Tinghúsvøllur on Vaglið, where people are waiting for the procession to arrive. The people who walk in procession then gather on the triangle-shaped Tinghúsvøllur in front of the parliament building (Løgtingshúsið og Tinghúsið), there will be a speech by someone who is appointed, and this person will officially open the Ólavsøka. A brass band normally plays at the opening. 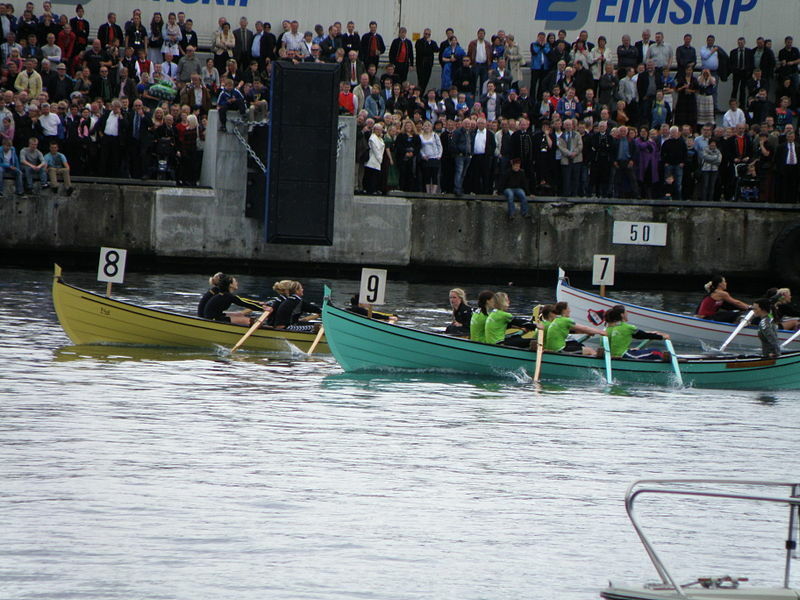 The Ólavsøka Boat Race is always held on the eve of Ólavsøka on 28 July. Before the Ólavsøka festival there are several other village festivals around the islands, where preliminary rounds of the Faroese version of boat racing are held, starting at the Norðoyastevna in Klaksvík (either in the beginning of June or in the end of May). The Faroese boat race has several divisions, divided into groups of children, boys, girls, men, and women. The boat races are also grouped by the size of the boats. All the boats are standard wooden rowing boats. The rowers sit together two and two, and one person steers at the back of the boat. In Faroese the boats are called 5-mannafør, 6-mannafør, 8-mannafør and 10-mannafør, depending on the size of the crew. The crews who win each division of the Ólavsøka Boat Race win a trophy and the winning boats also win a trophy. Because a particular boat can be rowed by groups of men, women, and children, it may win several trophies. The distance is 1,000 meters for adults, and shorter distances for the children. Traditional Faroese food is mainly based on meat, seafood and potatoes, and uses few fresh vegetables. Mutton is the basis of many meals, and one of the most popular treats is skerpikjøt, well aged, wind-dried mutton, which is quite chewy. The drying shed, known as a hjallur, is a standard feature in many Faroese homes, particularly in the small towns and villages. 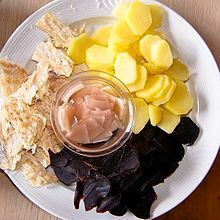 Other traditional foods are ræst kjøt (semi-dried mutton) and ræstur fiskur, matured/fermented fish (very much an acquired taste). Another Faroese specialty is grind og spik, pilot whale meat and blubber. (A parallel meat/fat dish made with offal is garnatálg, a caul wrapped package somewhat like Scottish haggis). Well into the 20th century, meat and blubber from a single pilot whale fed a whole community for some time. Fresh fish also features strongly in the traditional local diet, as do seabirds, such as Faroese puffins, and their eggs. Dried fish is common as well. Here is a modern recipe created by the Bakkafrost salmon company from the Faroes. I chose it because it replicates some of the complexity of traditional fermented fish, but is likely to be more palatable to people outside the Faroes. I’ve given the recipe in Faroese first, just for fun. Being a fan of fresh salmon, smoked salmon, and blue cheese I find the combination irresistible. I use stilton or roquefort, but you can use whatever blue cheese is available. Bakkafrost recommends a spinach, avocado, and mango salad as an accompaniment. eitt lítið sindur av vatni í fatið. Set inn í ovnin á 175 stig í umleið 20 minuttir. 4 salmon portions (125 gm/4.5 oz each). Slice once horizontally through the middle of each piece of salmon. Insert the cheese and a slice of smoked salmon in between the two halves of salmon. Season with freshly ground black pepper. 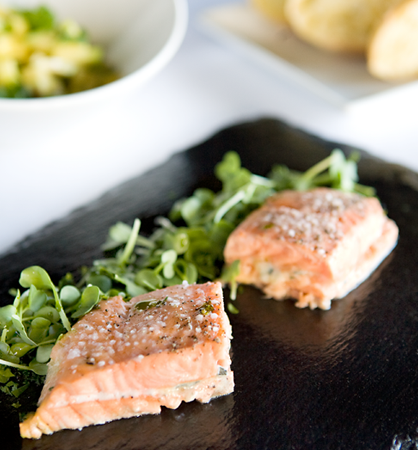 Place the salmon pieces on a buttered oven-proof dish and add a little water to it. Put it in the oven at 175°C/350°F for approximately 20 minutes. Very interesting. Your narratives always are! The recipe does indeed sound delicious. Not so much the pilot whale blubber. I’ve had blubber once. Ranks right up there with fermented fish.